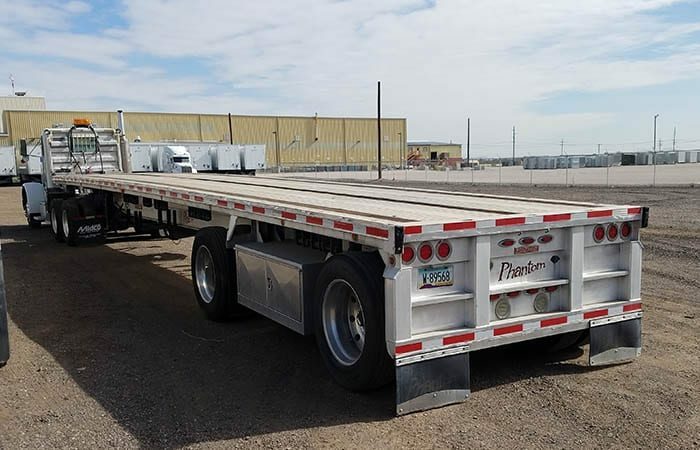 A 2007 Fontaine Phantom aluminum flatbed trailer is available at Midco Sales’ heavy trailer dealership in Chandler, AZ. This trailer measures 48′ long by 96″ wide. It has air ride suspension, spread axles and all aluminum wheels. Winch tracks and chain ties provide cargo control solutions. And toolboxes are mounted on both sides of the trailer, between the axles. Contact Midco Sales at (480) 999-0607 for more information on this trailer or on any of the flatbeds in stock.